SFLOWER1RD The self inking stampers do not come with a pre-inked pad. Ink is sold separately. Now this stamp pad can be used with any stamping ink but the IFWA-C0 is the best with IFWA-C7 Clear Red being the second best. Click Here to get your pint of IFWA-C0 Cancun Clear Blue Readmission Hand Stamp Ink. This is the best ink for invisible markings. Instructions to Change Ink Pad for Self Inking Stamper. 1. Lock the self-inker in the first position by pushing down 1/8" and pressing buttons on the side of the self-inker. 2. Push ink pad out with finger or pen. Remove pad. 3. Insert new ink pad. Press down and release. Readmission ink, hand stamp ink, or pass-out Ink as it is sometimes called, is a fast drying ink that is used to stamp paying patron's hands at your event. The strong fluorescent capability of our ink allows the establishment to easily identify paying customers. Ready To Use - No Mixing! Economical low cost high Value! Made for use with Risk Reactor Black Lights! Our inks are used extensively to control admission by marking patrons of bowling alleys, racetracks, amusement parks, dance halls, bars, rodeos, concerts, or any event. People also use our Readmission Inks to prevent people from obtaining second servings, gifts, or other valuable products by marking patron. Applications.Use by applying a rubber stamp (We make custom stamps, click here for more information.) imprint of our fluorescent ink to the patron's hand. The ink is invisible on the skin, dries within seconds, and cannot be transferred or washed off. The ink dries fast so that the patron can not share the image with other patrons. Pass the hand under one of our black lights to see the invisible marking. This bright, durable ink works up to twenty four hours. You may change colors periodically, or change the marking pattern so as to control traffic into separate shows or security areas. It is suggested to use a non-symmetrical stamp to ensure difficulty is duplicating and to change color periodically. How do I use the kit? Pour enough IFWA-C0 Cancun Clear Blue to wet the surface (cap full) of a clean PAD-1 Un-Inked Stamp Pad. Then stamp on the wet pad and then onto the desire surface. Review the invisible mark under one of Risk Reactor’s offered Black Lights such as the B14LED a 14 UV LED powerful, portable Black Light (3 AA INCLUDED!) that you now have. We also manufacture Special Readmission Inks for clients that have a particular need such as slower drying, faster, stronger, and non-flammable characteristics. We carry portable, battery-operated, and plug in black lights, so you can use them with or without a power source. You can also use the kit to mark other porous surfaces such as paper, tickets, coupons, etc as a security mark. Our UVSTAMPER-KIT complete Readmission Kit is the perfect way to get started on controlling patron admission to an event, party, or club. Our ink is incredibly brilliant and easy to see allowing your staff to be efficient in pass through traffic. Send in your black and white image via email to sales@riskreactor.com Save Money by Buying the Kit! Click Here to Get your Self Inking Kit with Stocked Stamp Image! Click Here to Get your Self Inking Kit with Custom Stamp Image! * 1 Unique Stocked Stamp! * High Quality 14 UV LED Portable Battery Operated Black Light (B14LED) WITH BATTERIES! Perfect kit for each door of entry. * PAD Uninked Felt Sponge Stamp Pad! * IFWA-C0 1 Pint of Risk Reactor's Clear Cancun Blue Readmission Ink! Our Readmission Kit has everything you need in one box! Safe, simple, portable, and convenient! The kits INCLUDE BATTERIES so you can use instantly! Our UVSTAMPER-KIT includes 1 Pint of Clear Blue Readmission Ink (IFWA-C0), Stamp Pad Large Size (PAD-1), 1 Unique Stocked Stamp with your artwork, and a High Quality 14 UV LED Portable Battery Operated Black Light (B14LED). Perfect kit for each door of entry. 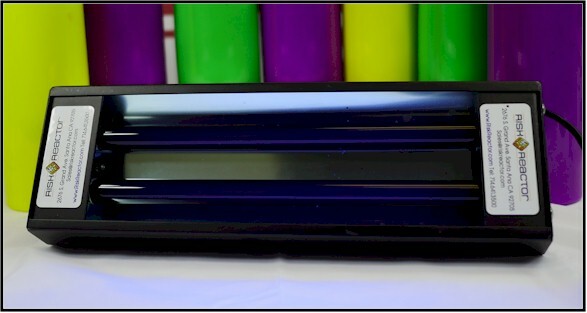 Our UVSTAMPERKIT-CUSTOM includes 1 Pint of Clear Blue Readmission Ink (IFWA-C0), Stamp Pad Large Size (PAD-1), 1 Custom Stamp with your artwork, and a High Quality 14 UV LED Portable Battery Operated Black Light (B14LED). Perfect kit for each door of entry. UVWOOD-KIT Click Here to Buy Your Invisible UV Kit Complete. Has everything you need to mark porous materials invisibly and to review the marks with the black light. UVWOOD CUSTOM-KIT Click Here to Get Your Invisible UV CUSTOM STAMP Kit Complete. Has everything you need to mark porous materials invisibly and to review the marks with the black light. These items can be bought separately as well. Click on the links below to add them to your order. Use your back button to continue shopping on this page. 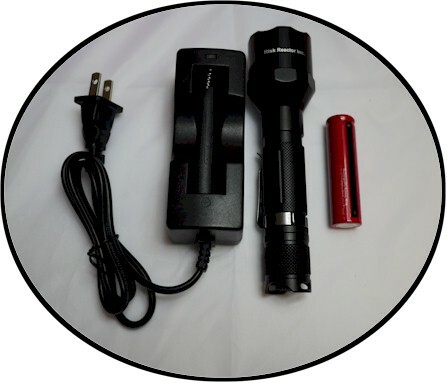 14 UV LED Battery Operated Flashlight Black Light perfect for our readmission applications, automotive leak testing, inspection of inks, dyes, and paints. Click Here to Buy B14LED Blacklight Flashlight Separately. Aluminum Casing with Rubber Grip. “AAA” Batteries Included! Click Here to Get more B14LED black light flash lights. 16 Ounces of IFWA-C0 Cancun Clear Blue Readmission Ink. PAD-1 Un-Inked Stamp Pad for use with IFWA-C0 (or any other ink) and Walnut Wood Handle Hand Stamp. Click Here to Buy Un-Inked Stamp Pad Separately. Click Here to get more PAD-1 un-inked stamp pads. Click Here to Buy Your Custom Image Walnut Wood Handle Hand Stamps Separately. Click Here to Buy Your Stocked Image Walnut Wood Handle Hand Stamps Separately. Round Self Inking Stamper plastic and durable. Click Here to Buy your Stocked Image Round Self Inking Stamper Separately. Click Here to Buy your CUSTOM IMAGE Round Self Inking Stamper Separately.